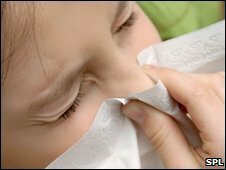 BBC News - Did UK get it right on swine flu? Did UK get it right on swine flu? Governments and health chiefs took unprecedented steps to keep the first pandemic for 40 years at bay - but with the swine flu virus now looking to be on its way out, the question on everyone's lips is did we over-react? It was a Friday afternoon in April when reports began to emerge from Mexico of a new flu virus. By the following week, headlines were warning a "killer pig flu" would sweep the world. A global flu pandemic was duly declared, governments started handing out stocks of anti-flu drugs they had stockpiled, and manufacturers dived into vaccine production. But the urgency of the first few months looks misplaced now the virus seems to be petering out despite the fact Europe is in the middle of a bitterly cold winter. In the UK, the levels of illness are below what would be expected during an average winter. And with 360 deaths so far, questions are being asked about whether health officials over-reacted. The financial cost of preparing for the pandemic is yet to be calculated. However, it looks likely the bill will run into many millions of pounds as enough doses of Tamiflu and Relenza - the anti-viral drugs that can lessen the symptoms of the flu - and the vaccine were bought for the whole population. Critics The UK government is now looking into whether it can stop purchasing the jabs it had placed orders for as experts predict a future rise is unlikely. Another option is selling them to other countries or donating them to the developing world. Meanwhile, the World Health Organization (WHO) has already announced it will review its handling of the pandemic. Council of Europe health committee chairman Wolfgang Wodarg has been one of the most vocal critics. He has said experts have been unduly influenced by the pharmaceutical industry, and questioned whether a virus that proved to be so mild could really be classed as a pandemic. Indeed, the death rate among those infected in the UK was remarkably low, at 0.026%. What is more, hundreds of thousands of people are thought to have been infected but not displayed any symptoms. Sir Liam Donaldson, the government's chief medical officer and public face of the fight against flu, has found himself having to defend accusations he personally over-reacted. At the start of the summer, he released data showing more than 60,000 people could die this winter in the UK. That was subsequently reduced to 1,000 - and even that figure now looks like an overestimate. Sir Liam, who has been the driving force behind the flu preparation work that made the UK one of the best prepared countries in the world, has always maintained it was important to plan for the worst. He says the tough approach has acted as an "insurance policy and saved lives". London School of Hygiene and Tropical Medicine health policy expert Sandra Mounier-Jack has some sympathy for Sir Liam. She says: "The problem is that we just did not know how serious the strain would be. It could have been much worse if it had been bird flu. "These things are impossible to predict and if you do not take the right precautions you will be criticised. "You could argue the UK should not have bought so much vaccine. "One of the problems was that all the planning by the WHO and international governments assumed it would be a serious virus and therefore the emergency plans included things such as cancelling non-emergency health care. "But this was not really relevant for a mild strain, which is what we got. In the future we might see a more tiered approach where we have different levels to reflect the seriousness." Despite this, Ms Mournier-Jack believes the experience in this pandemic will stand the UK in good stead. "We have seen NHS trusts talking to councils, fire departments, et cetera. Relationships have been built up and that is something that will be of benefit for some time." Royal College of GPs president Professor Steve Field agrees. "We were very lucky it was not the nasty, sinister virus we feared. If it had been and we had not acted we would have been rightly criticised." Other experts are also warning the government not to become too complacent now the number of new weekly cases has dropped below 5,000 in England - compared with the peak of 100,000-plus in the summer. Professor John Oxford, one of the UK's leading flu virologists, says: "I will not relax until February or March. This virus could always mutate. It has not really got into the elderly yet and if it does we could see many more deaths. "There is also the risk it could come back next winter - that has happened in previous pandemics." He also points to the experience of other less developed countries as a warning about what could have happened if the UK had not taken such a proactive stance. In the Ukraine, the government came under fire after a surge in cases left hospitals swamped with patients and led to restrictions on movement. Professor Oxford says: "The approach in the UK has undoubtedly helped to minimised the impact of this virus."